Most draftable players fall between the ages of 21 and 23 on draft day. In the rare event of a 5th-year senior, some players are 24 years old on draft day. Every now and then, an outlier will emerge such as JuJu Smith-Schuster being only 20 years old on Draft Day. 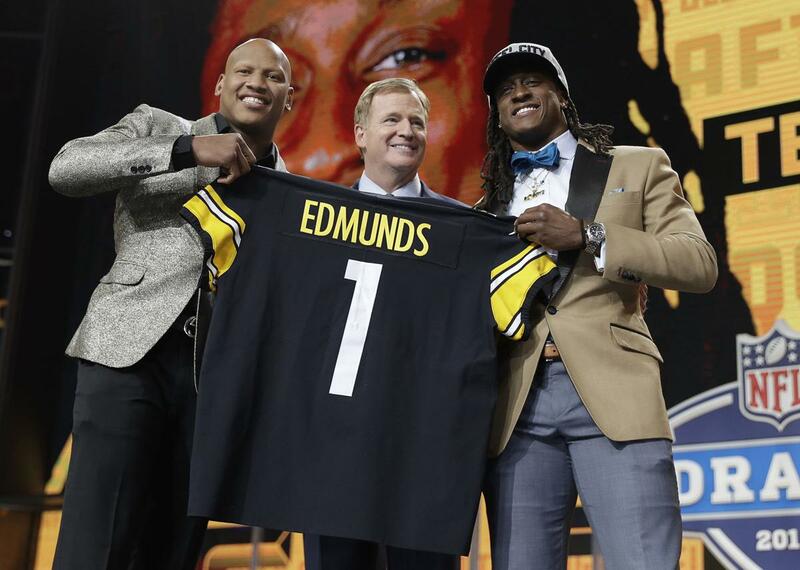 Over the last decade, two 19-year olds have been taken in the first round of the draft: Amobi Okoye by Houston and Tremaine Edmunds by Buffalo. Last year, FiveThirtyEight found that the average age of first round picks league-wide has dropped by almost 1 year since 2000. For the Steelers, this has been a distinct trend of the Colbert Era. On the whole, most of their draft picks have been either 22 (62 players) or 23 (65 players) years old. However, when looking at just the early rounds of the draft, there is a tendency towards younger players. Of Colbert’s 19 first round picks, 15 of them were 21 or 22 on draft day. Of the 17 second round picks, 13 were 22 or younger on draft day. In total, 78% of Colbert’s first and second rounders have been 22 or younger. This has become an increased priority in recent years. Colbert’s first three first round picks (Plaxico Burress, Casey Hampton, and Kendall Simmons) were 23, 24, and 23 respectively. Since 2003 only 1 of 16 first rounders (Jarvis Jones in 2013) was over 22 years old. 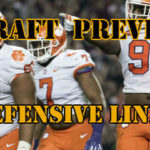 For second rounders, the four 23-year olds were Antwaan Randle El (2002), Bryant McFadden (2005), Limas Sweed (2008), and Marcus Gilbert (2011). In the last five drafts, every player Colbert selected in the first and second rounds has been 22 or younger. The middle rounds of the draft start to see more players older than 22 selected, but it is still balanced. With his third round picks, Colbert has selected 11 23-year olds and 12 players 22 or younger. Last year’s third rounders were 23-year old Mason Rudolph and 21-year old Chukwuma Okorafor. There is some correlation here between the Steelers starting to dip into non-Power conference players in the third round and the balance of ages. Three of the four non-power conference players Colbert has selected in the 3rd round have been 23 years old (Hargrave, Archer, Sanders). In the last five years 3 of the 7 third round picks were 23-year olds. In fact, these are the only players older than 22 that Colbert has taken in the first four rounds of the draft in the last five years. Since 2011 Colbert’s only 4th round pick that was not 22 years old was Landry Jones (24 years old in 2013). As with the third round picks, 2 of the 3 non-power conference players Colbert picked in the fourth round were 23 years old. The Steelers trend towards taking older players does not come into play until the later rounds of the draft. 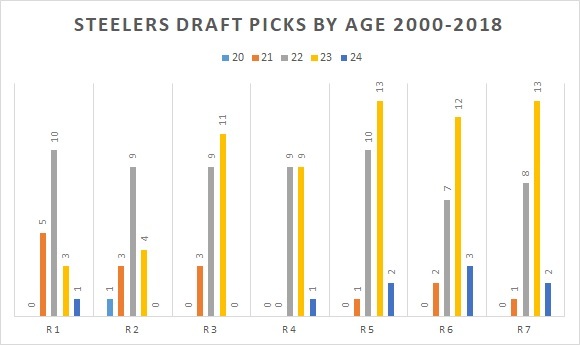 A majority (61%) of the Steelers selections in the 5th, 6th, and 7th rounds have been players 23 and older. In the last five years, 7 of the 10 23-and-older players the Steelers have taken have been selected in the 5th round or later. In the later rounds, the correlation between age and players from non-power conferences goes away. In order to look at the changing trends, here is a side-by-side view of the breakdown of ages between the total 19 years Colbert has been GM and the last five years. 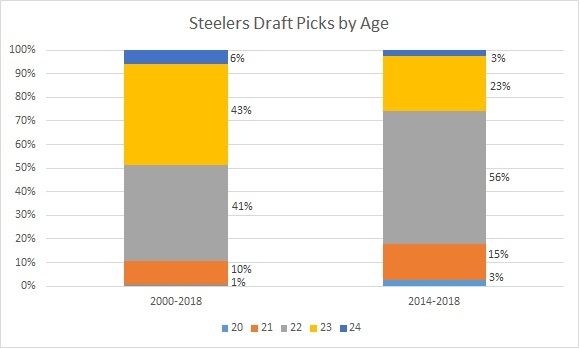 In conclusion, if the Steelers continue their current trends of drafting younger players in the early rounds, this metric can be used to narrow down the field of potential draft picks. The biggest name that is potentially eliminated is Michigan’s Chase Winovich. So far, Winovich is the only player the Steelers have reportedly had dinner with (though it is likely the team was just better this year at keeping their pre-draft dinners under wraps). Winovich will be 24 years old on draft day, which would be a distinct departure from 19 years of historical trend data if the Steelers select him in the early rounds of the draft. Noteable 23-year olds include Florida RB Jordan Scarlett, Oklahoma St LB Jordan Brailford, and TCU EDGE Ben Banogu who all have come to Pittsburgh for pre-draft visits. Penn St CB Amani Oruwariye, Clemson LB Kendall Joseph, and South Carolina WR Deebo Samuel had Pro Day attendees from the Steelers and are all 23 years old. The Steelers have shown a willingness to draft older players from non-power conferences, which could be good news for New Mexico St LB Terrill Hanks and Toledo WRs Cody Thompson and Jon’vea Johnson.